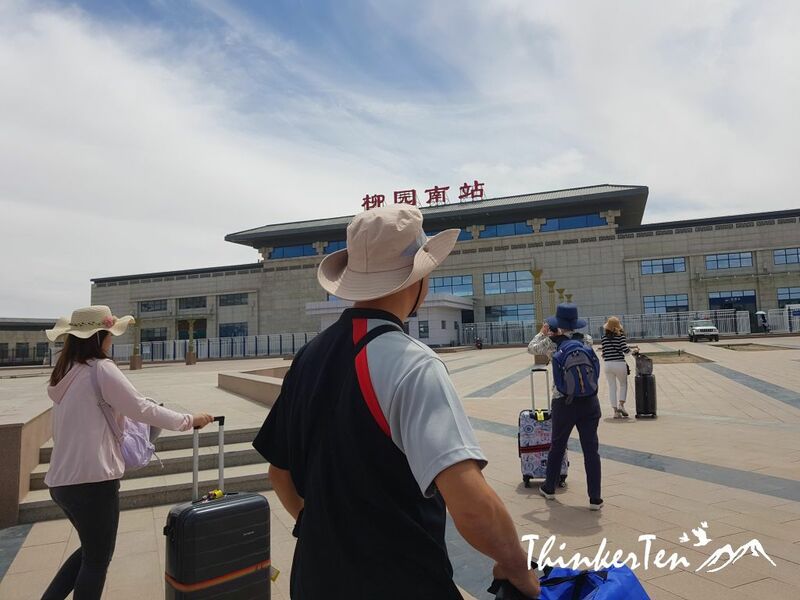 Today we needed to catch the bullet train from Liuyuan to Turpan Xinjiang. 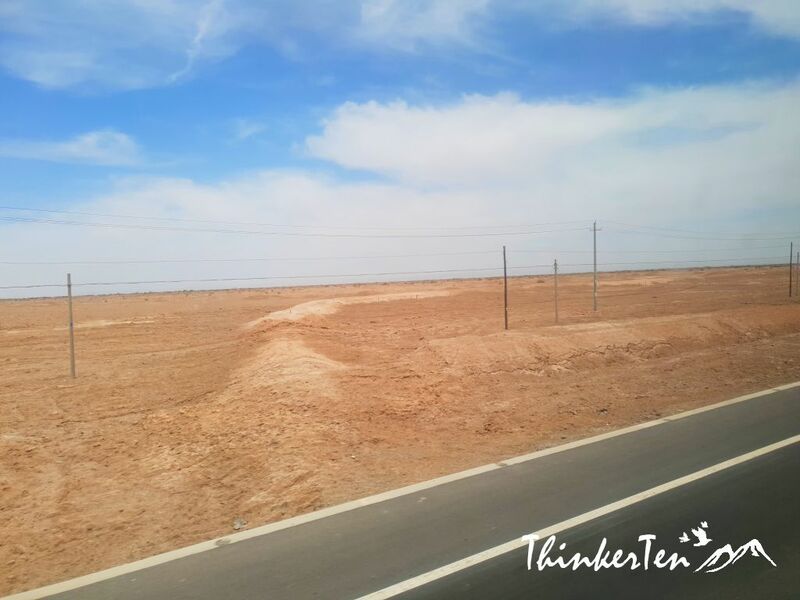 We are crossing to another province in China -Xinjiang. 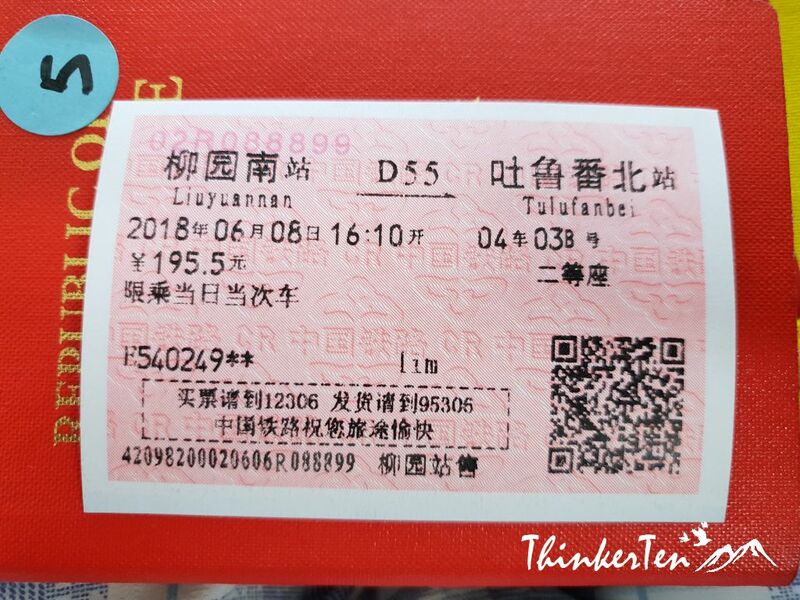 So our schedule was tight, we rushed our lunch at Dunhuang city then traveled about 1.5 hour to reach Liuyuan Station. On the way to Liuyuan Station, basically there is nothing when you look outside the window of the bus. (Refer to above picture). Our bus stopped at the bus bay which is about 5 to 10 mins walk to Liuyuan Station. 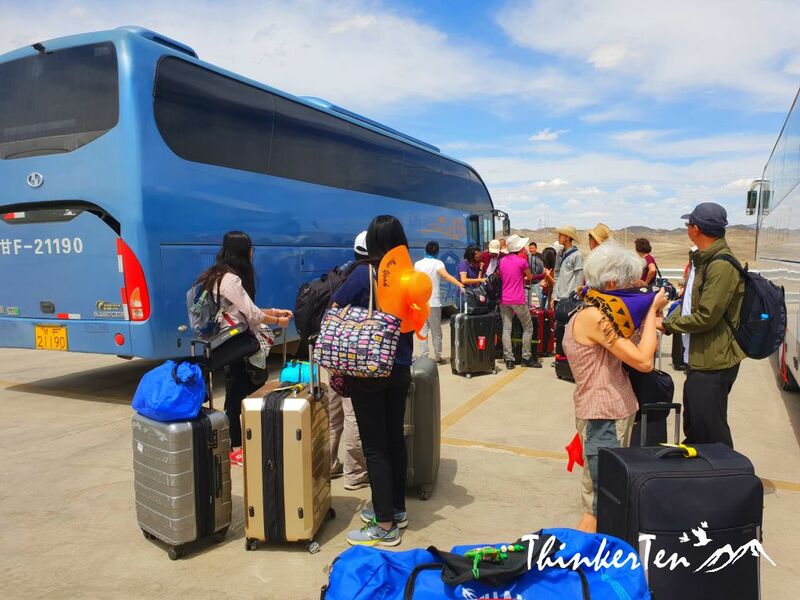 We unloaded all our belonging as we are going to bid farewell to our tour guide and bus driver from Gansu who were with us for the past 5 days. The weather was super hot and I did not see a single tree. We walked under the hot sun for less than 10 mins then finally reached Liuyuan Station. 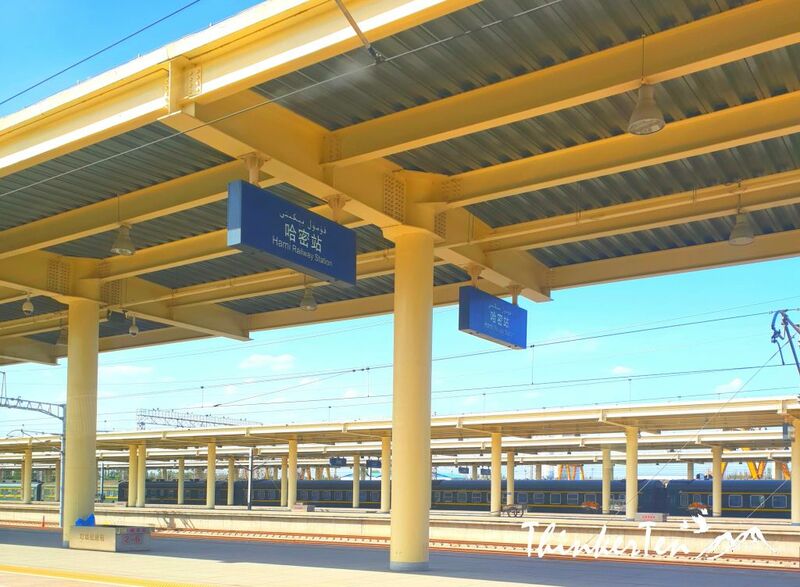 Liuyuan belongs to Gansu in territory and the passenger is mainly taking Dunhuang as the destination, but its transportation business is under the jurisdiction of the Urumqi Railway Bureau. So you will expect a lot of security check in this station! 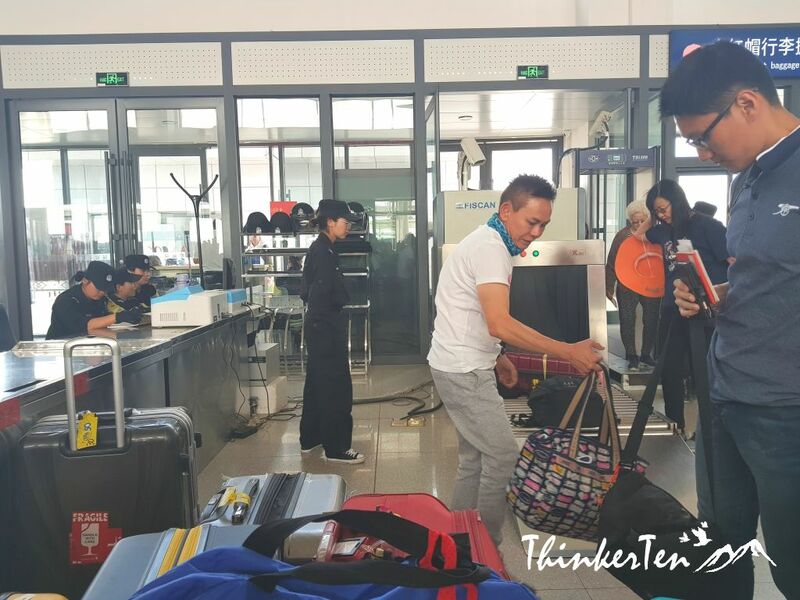 Before entering the station, all bags small or big suitcases needed to go through the security checks. No knives or sharp objects, not even Swiss knife are allowed in ANY of your bags! Not even in your big suitcase! If the security scan detected any sharp objects, the security officer will ask you to open your big suitcase and dig out the item, so you end up wasting time doing so. My suggestion is to leave the sharp objects behind and don’t bring it with you. I left my Swiss knife at the bus. 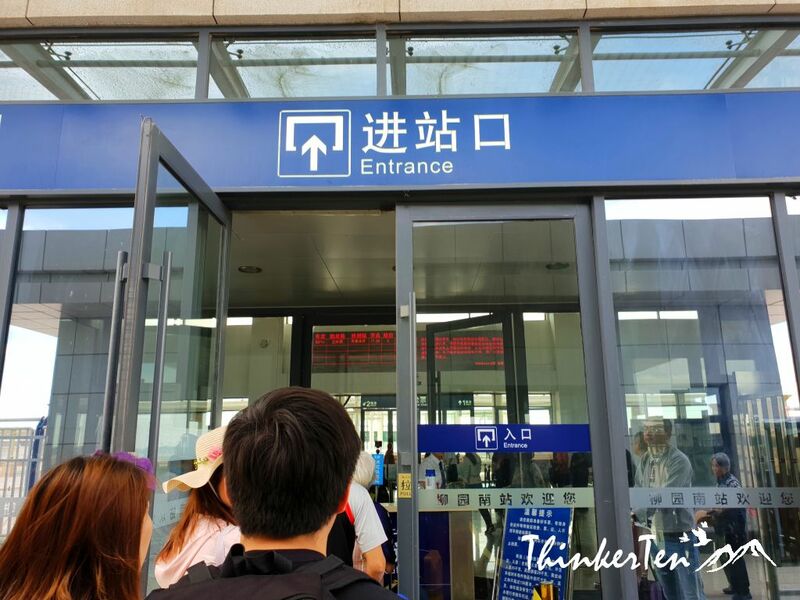 Always arrive 2 hours earlier before the train depart as you need to go through the security checks in Liuyuan Station. Once we went through the security checks, we settle down at the waiting hall. There are clean toilets available but no toilet paper. Bring your own toilet paper. Train Door only open for 5-10 mins! The train only stop at Liuyuan for 5-10 mins, so we all have to rush like mad to push all our belonging into the train. In average, each person from our group have two bags, one big suitcase with wheels and one small bags. Check which compartant you will be siting at, then get in immediately once the door of the train open. Rush in like a refugee as there are so many people behind you needed to board in as well, within the 10 mins time frame. Door closes after 10 mins. We were lucky to have boarded safely, nobody left behind and that is the good thing. We then looked for our seats in the train compartment. The seats are very new and clean. You will notice there are cleaners cleaning the trash or mopping the floor almost every half an hour. 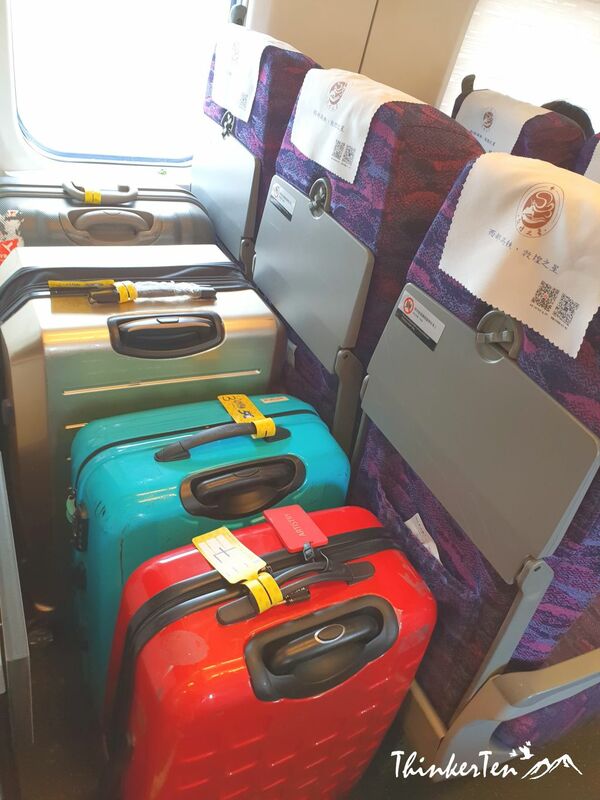 How to place your big luggages in the train? We put all our suitcases near the door and the small suitcases you may want to lift up and put at the top compartment at your seats. 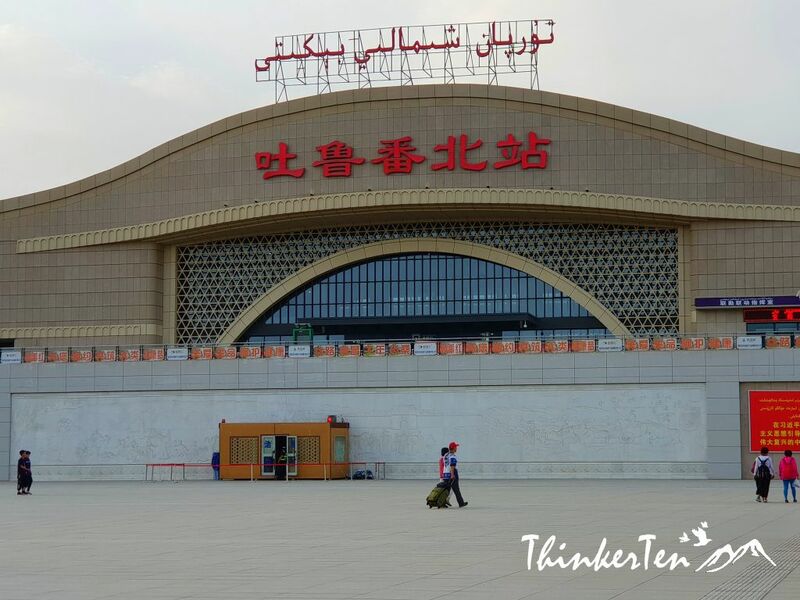 We passed by Hami / 哈密 Station also known as Kumul in Uyghur language, this place is famous for its sweet Hami melons / 哈密瓜. Hami is located at the border with Gansu province. We knew we were entering Xinjiang! We encountered police random checks at the train. Several police spotted us and asked us few questions, such as where are we from and where are we going? After that, the police decided to take all our particulars down with their cell phone. They took photos of our passport documents and a close up picture of us. 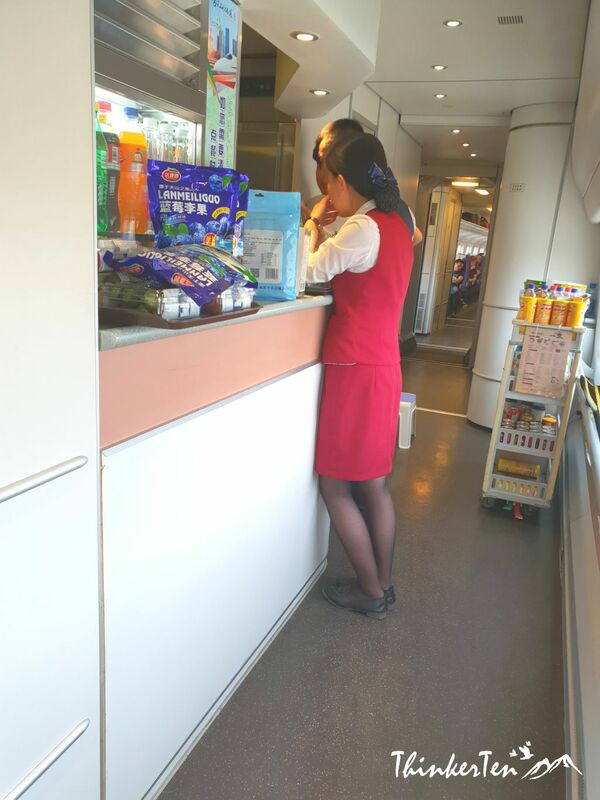 There are kiosk at the train so if you need some snacks, you can get it there. Alternatively there are also staffs passing by your seats, carrying fruits or snacks. You can also order tea or coffee from them and they will bring it to your seat. I am quite impressed at the clean toilet in the train and with toilet paper! There are even soup and water after toilet! 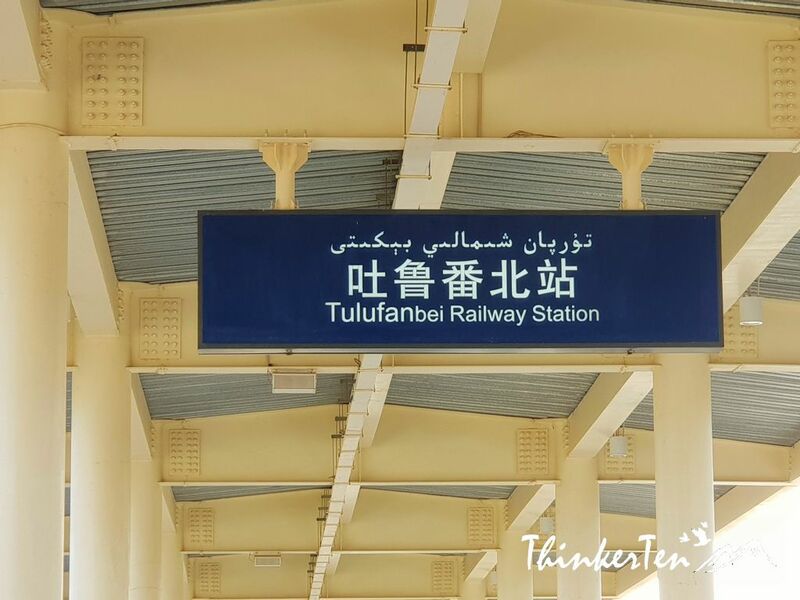 The high-speed train from Liuyuan to Turpan took us about 4 hours. Nothing much to see if you look outside the window. Mainly vast land with mountains only. No shops or houses. 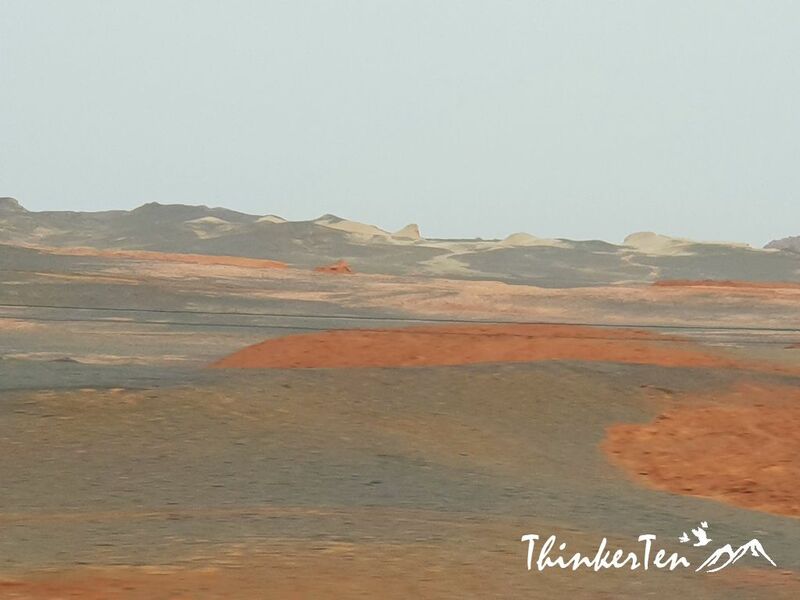 We arrived at Turpan at around 8pm, we finally reach Xinjiang Autonomous Region! We were all so excited. We waited 15 mins earlier at the train door, then prepared to rush out once the door open as you know the door only open for 10 mins. 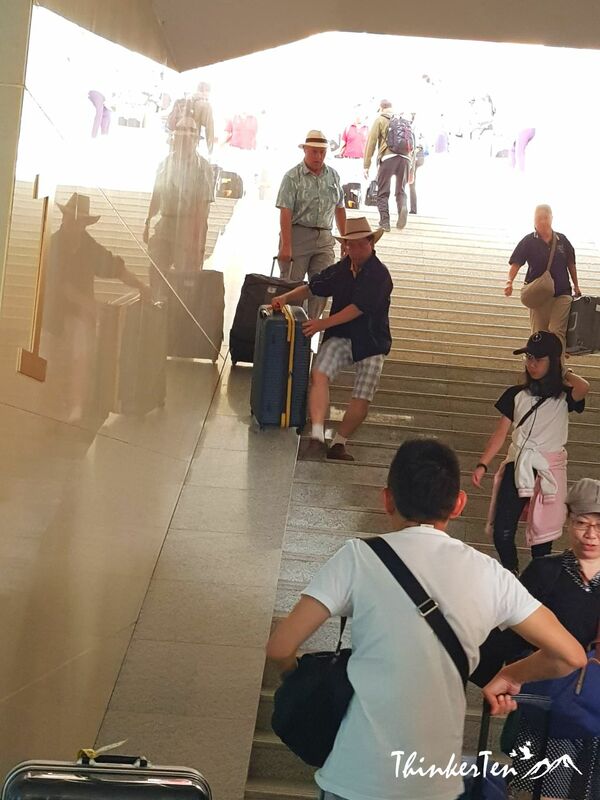 There is no elevator or lift up the station so we need to carry our own suitcases and bags down the stairs to exit the station. Before exit the station, there are some security checks at the exit gate. 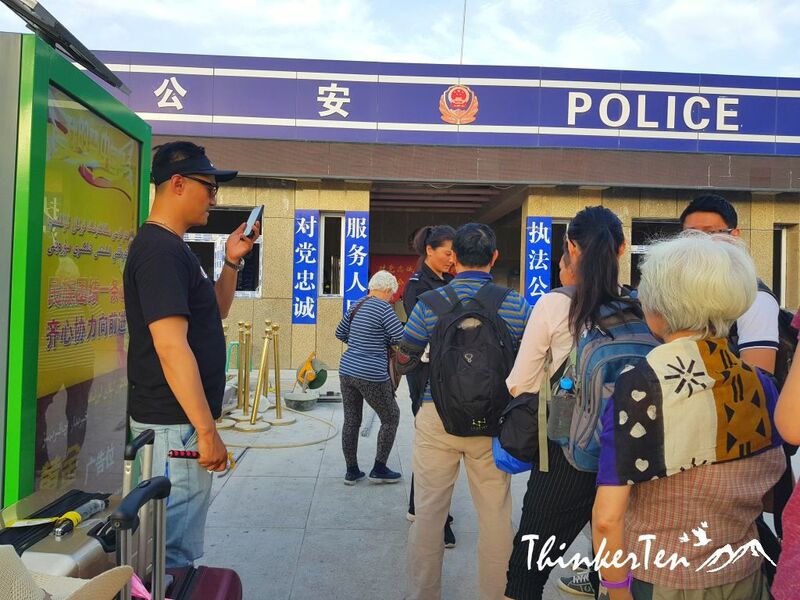 Just when we thought we were out from the hassle from the train station and could enjoy a good dinner, we were stopped by two police officers holding big machine guns. They demanded all of us to report to the police station before going up to our bus. They did not let us go by the line despite our Xinjiang tour guide pleaded them several times. We have no choice but walk for 5 mins and line up at the front of the police station. Few police officer took photo of our passport documents and picture of us. It took us about 30 mins to complete all photo taking for the 30 of us. 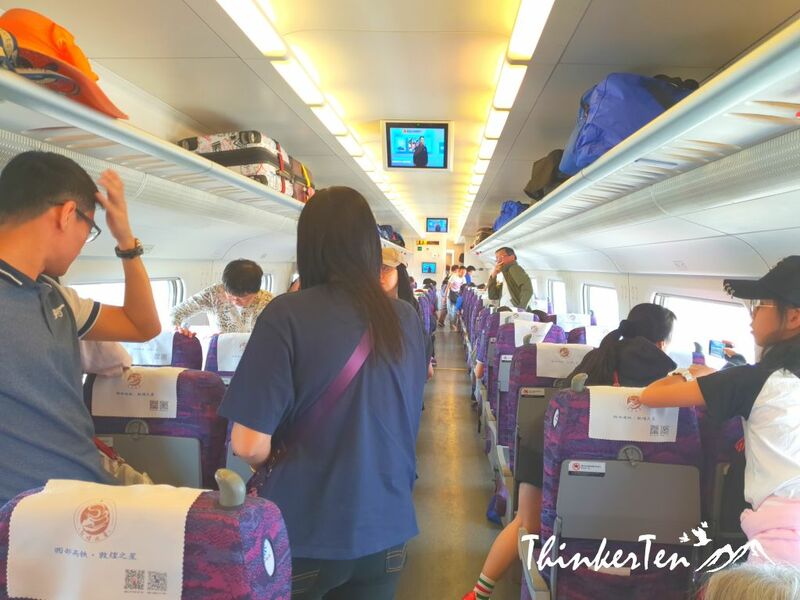 The journey can be very boring so bring along any electronics devices or books for the 4 hours train ride. That’s an interesting read. It’s easy on eyes and pics are also taking the story forward. I am also shocked why there is so much security. Decades ago, bloodshed including anti-government uprising, ethnic rioting happened in Xinjiang so China government has taken strict measures. You see security officers or Police officers every 500 m, there are even security scan before you enter to public toilets, supermarkets, restaurants and hotels. But then you know this is the safest place now since the security measure is so tight. These are all good tips! I don’t travel often but these are good things to think about in case I ever do. The pictures are engaging. Your exposition and travel tips will be useful to those planning a trip to that region of China. Thanks so much for your comment. I hope to give some head up to people who wish to travelling to North west of China, crossing from one province to another – Gansu Province to Xinjiang. This seems like a really good way to travel! I kind of wish we had more options like this where I live. I would make use of this type of travel! 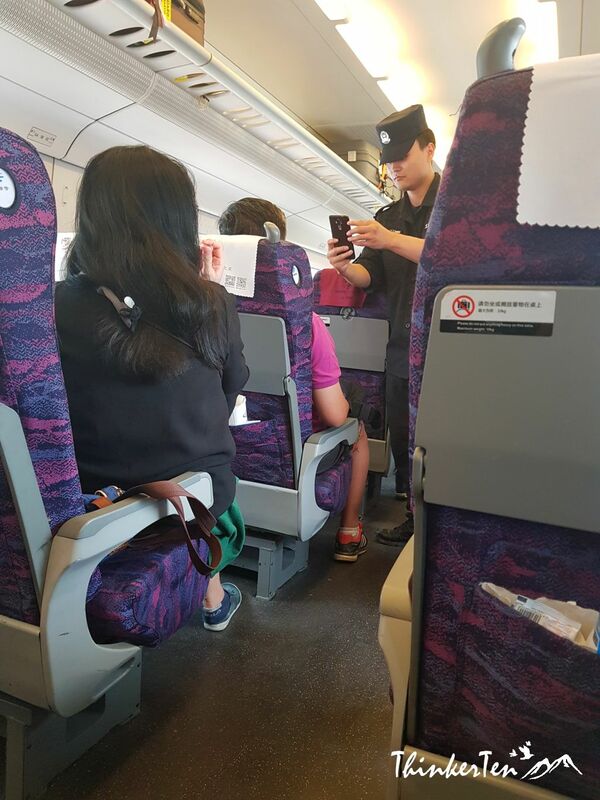 Travelling with Bullet Train within China has become so popular and convenient these days. It is safer and less traffic as compared to bus or car. Faster to arrive too since this is high speed, 350 km/h! 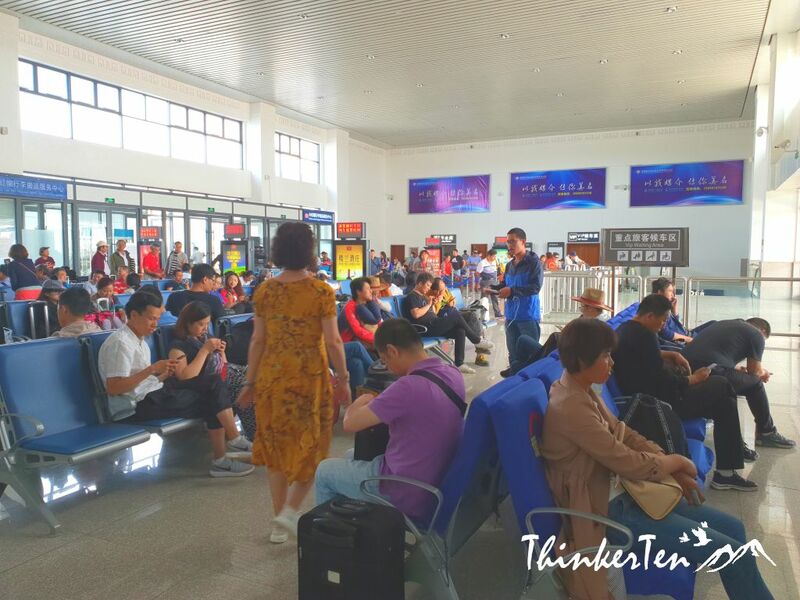 There were not many people when we travelled which was lucky, at least not any Public holiday for China. It was summer and during some exam period for high school student so pretty quiet. The view during the ride was just “vast land”, so better to get yourself a book for the few hours journey. How crazy! I normally love traveling by train but this feels like it would be super stressful. Getting into train can be a bit stressful especially when the train door is just open for 10 mins, and we have to make sure all our luggages are in! That is the greatest challenge. Wow! What a great experience, the ride was smooth. I do loved the security they are implementing, it’s should always be safety first. You are totally right, if the security is tight then we are pretty safe! My husband and I took a train to New York, it was fun but our train broke down half way there! This looks like it was a better trip! The bullet train is super fast and travel in high speed which reach the destination very faster than car or buses. Nowaday bullet trains has helped to connect people within China and make their life easier. I travel frequently but the bullet train is one way I’ve never traveled. It sounds like such an interesting and smooth experience! The getting and out of Bullet train is a bit hassle as you need to be quick so there might be so stress but once you are in the train, it is a smooth ride to your destination. This is great for anyone who needs information and a guide to travel there. I love to travel. Wow, I felt like I went on that journey with you. I enjoyed that firsthand look into your experience. The pictures really brought it to life. Thank you for yor comment. I hope my post can help anyone who is trying to catch the bullet train/high speed rail in China. That police checks would’ve quite shocked me too, especially with them taking close up pictures of us; and those at the police station even held machine guns! And was that a squat toilet? 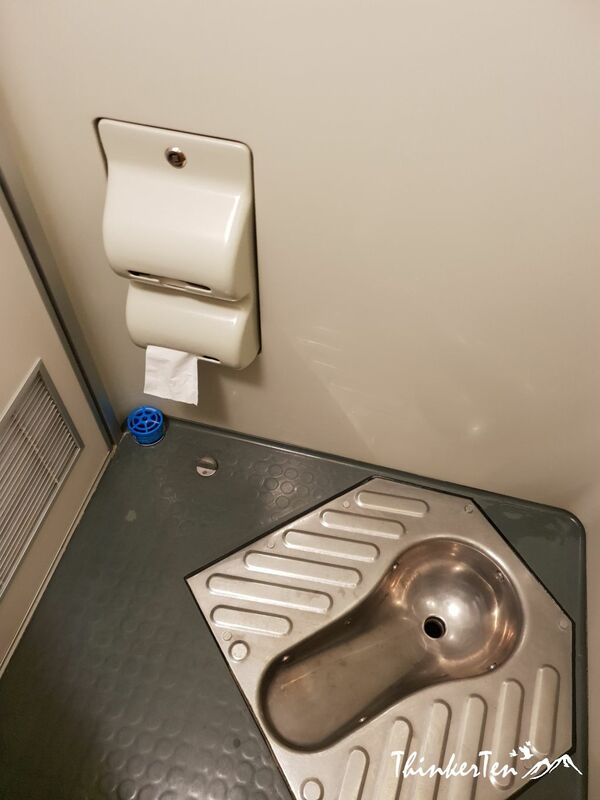 Wasn’t that gonna be hard to do your business with a squat toilet, on a moving train? Despite those, hopefully the rest of the journey had been such an enjoyable experience for you! Hahaha, you are right! 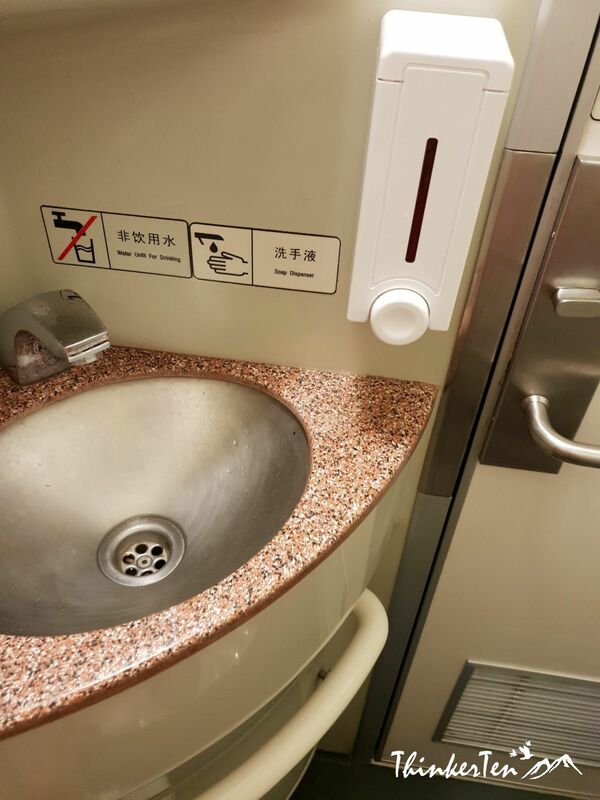 Squat toilet is so common in China and to do a big business on the moving train wasn’t going to be easy for sure. LOL. Trust me, I did a small business on the moving train and gosh, it was challenging to keep balance. The police officers with big machine guns are pretty shocking at first but then think deeper, they are just there to protect terrorists from happening so Xinjiang is safest place in China. We have a similar concept train in Central Florida. It’s a great way travel to avoid the congestion going into the city Sounds like a great way to travel from point A to B. 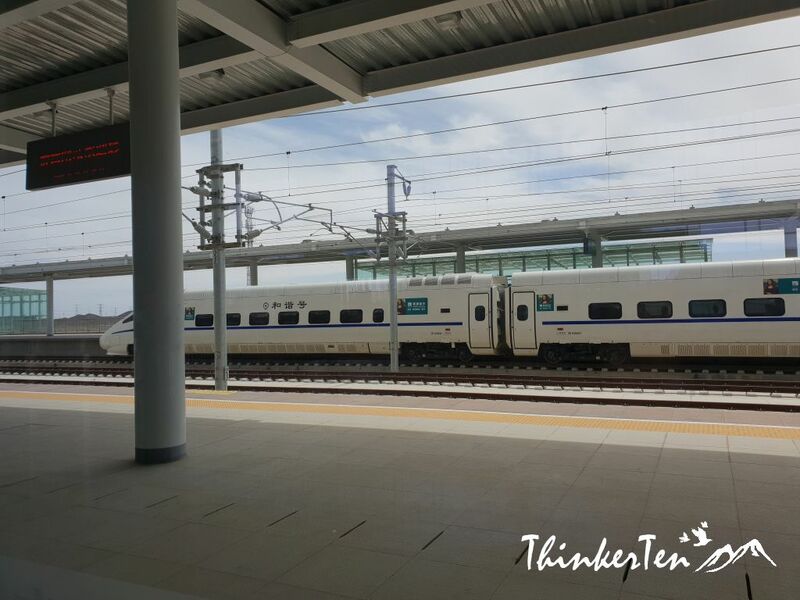 With high speed rail available in China, it is pretty convenient to travel from one place to another. It is faster than bus or car and also safer. This is such a wonderful post. Those police checks seems INTENSE, I would have also been shocked.Thanks for sharing! This looks like a great way to travel by train! Love the purple color in the seats! Great pictures. That seems like a fun ride. The interiors look so good! The interior of the bullet train are great, clean and comfy seats. It is well maintained and that is so important. Thanks for sharing your experience! I have heard that you need to get on these trains fast because they leave exactly on time. That makes me a little nervous! It’s nice that they take security so seriously though especially with how crazy the world is right now. Thts looks great, its lot of details. High Speed Trains are better and clean thats the best part of it. will add this in my bucket list to visit this place in china..! Wow! It looks a fun ride! I think it is kind of cute how you describe all these cool things and then say the journey can be boring. I have always wanted to take a train. This will help us out on our upcoming trip to China! TY so much! I just love trains! any trains are super cool to me but bullet trains are on top of all! I think arriving early is the key to any good travel plans. You never know when an unexpected event will delay your trip. And the security checks are so strict and taking a bit of our time at the station. We were told no sharp objects in ANY of our bags, not even in the big suitcase!